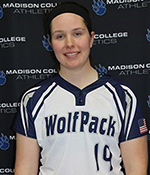 A second-year player on the Madison College softball team, Brooke Heck is averaging .429 at the plate this season. She has 21 hits in 49 at bats and has eight doubles, two triples and one home run. Last year, she started 56 games and led the team in batting average at .460. She set school records for hits (87) and doubles (28) and was named first-team all conference. Heck is a graduate of Beaver Dam High School, where she was selected honorable mention all conference (Little Ten) as a sophomore and first-team all conference as a junior and senior. The daughter of Tom and Kim Heck, she is a liberal arts major. 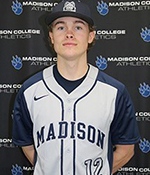 Freshman catcher Logan Michaels is currently leading the Madison College baseball team in batting with a .560 average. He has 14 hits in 25 at bats, including one double and two home runs. He has scored seven runs and driven in four. Michaels has played in 10 games so far this season, starting eight of them. A graduate of DeForest High School, he was a three-time all-conference (Badger North) player and team captain his senior year. He played in the WBCA All-Star game following his senior season. The son of Jeff and Peg Michaels, he is a liberal arts major.